See the top Nature & Adventure trips that go through Yellowstone National Park, USA. With 71 tours to choose from, they range in length from 4 days to 245. The most popular month for these tours is August, which has the most departures. 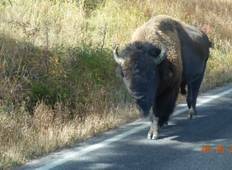 "The National Parks Wonders trip was our first with Trafalgar and it was MUCH better..."
"Would like to thank Carey Mills for taking me on a personal tour of Yellowstone and..."
"I liked the bus tour. 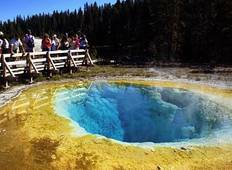 Our guide was very knowledgeable and the tour was not rushed...."
"I did both the 3 day National Parks and 7 day Yellowstone tours with Bindlestiff..."
"This was the best Southwest Adventures trip yet! I am a repeat customer. Trip was..."
"It was a nice tour. The itinerary was good, perhaps have more time at each site...."
"A great adventure without the hassle and time needed to plan logistics myself! Guide..."
"One of the best tours I have ever been on. My husband and my parents all were on..."